It’s no secret that the overall beer industry has been lagging, as the macro brands continue to lose ground and the craft sector feels the pain of oversaturation and increasing competition. New brands, styles and expressions are crowding the market, making growth difficult in the beer business. The beer stars in recent years have been Mexican brews, retro American brands and flavored malt beverages (FMBs) and craft, namely anything IPA. Several of those trends still hold according to our 2017 Beer Growth Brand winners. 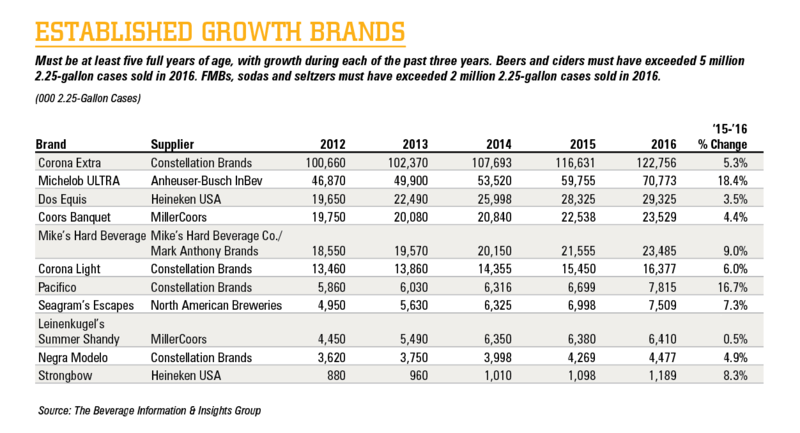 Some of the leading FMB brands have stumbled, though, and after growing steadily the past few years, cider consumption has slipped. The fledgling hard soda category is still strong, but hard seltzer has been stealing the spotlight in the past year. The hard soda trend may have started rolling with spiked root beer a few years ago, but orange was the big flavor in 2016. MillerCoors-owned Henry’s Hard Soda came out in late 2015 with orange and ginger ale flavors. The orange expression has leaped over the ginger ale, with more than 3 million 2.25-gallon cases sold in 2016, while Henry’s Hard Ginger Ale exceeded 1 million cases in its first full year. Rising Stars must be less than five full years of age, with growth each year of the brand’s lifetime. Domestic and imported beers must have exceeded 100,000 2.25-gallon cases sold in 2016; craft beers, FMBs, ciders, sodas and seltzers must have exceeded 50,000 2.25-gallon cases. Further tapping into consumer-nostalgic flavors, MillerCoors has extended the line with Henry’s Hard Cherry Cola, which came out in August 2016, and Henry’s Hard Grape soda, launched this past January. A-B InBev’s Best Damn Root Beer, which hit the market in 2015, exceeded 2 million cases in 2016; its Hard Cherry expression sold more than 1 million cases. The brewer introduced Best Damn Cream Soda this past March, and in a limited release in the Northwest and Midwest, Best Damn Sweet Tea. After several years of serious growth, cider slid back in 2016. Overall consumption was down about 4% from 2015, according to the Beverage Information & Insights Group, which compiles the data used to determine the Growth Brands winners. In fact, the only cider brand on the Rising Stars list is ABInBev’s Stella Artois Cidre, which increased 17% to 1.2 million cases. The company pulled the plug on its Michelob Ultra Light Cider brand this past spring. The FMB category seems to be suffering from flavor fatigue, as a number of brands have come to rely on new flavors to grow and haven’t been as successful. The Lime-a-Ritas franchise, which recently dropped the Bud Light from the Lime-A-Ritas name, is one feeling the competition from newcomers in the FMB category. A-B InBev discontinued the Raz-Ber-Rita and Cran-Ber- Rita flavors, among others, this past spring, while rolling a Grape-A-Rita nationally and testing an Orange-A-Rita. The company saw the Lemon-Ade-Rita flavor, launched in 2015, exceed 1.5 million cases in 2016. Lemon and citrus flavors dominated even more conventional brews. The Rising Stars list includes Citradelic Tangerine IPA, a year-round release from New Belgium Brewing that pairs Citra hops and tangerine, and Fresh Squeezed IPA from Descutes Brewery, with citra and mosaic hops that offer a citrus and grapefruit flavor profile. Meanwhile, Founders All Day IPA continues its roll, surpassing 2 million cases in 2016. Another pale ale, Little Sumpin’ Sumpin’ from Lagunitas Brewing Co., made the list with a 23% increase over 2015, reaching 1.8 million cases. The brand has been described as a hoppy pale American style wheat ale. The hard soda trend may have peaked last year, according to some reports, but hard seltzer is just getting started. Consumers looking for a clean and light flavors and healthier alcoholic beverages are driving the fledgling category. SpikedSeltzer, which launched in the Northeast in 2013, was purchased by A-B InBev last September. The brand, available in West Indies Lime, Indian River Grapefruit, Valencia Orange and Cape Cod Cranberry flavors, expanded nationwide this year. Boston Beer Co. launched Truly Spiked & Sparkling in March 2016. Available nationally in Colima Lime, Grapefruit & Pomelo and Pomegranate flavors, the hard seltzer brand sold more than 850,000 cases in 2006. The hard seltzer category stands to get a lot more crowded: Diageo’s Smirnoff unveiled its Spiked Sparkling Seltzer in late October; it’s available in Orange Mango, Cranberry Lime and Watermelon flavors. And MillerCoors came out with the 4.2% ABV Henry’s Hard Sparkling this past March, in lemon lime and passion fruit flavors. Modelo Especial Chelada is once again the top Rising Star brand. The blend of Modelo Especial beer with tomato, salt and lime flavors—an authentic Mexican “cerveza preparada” beverage—was up 25% in 2016. Fast Track domestic brands must have exceeded 9 million 2.25-gallon cases in 2014, and imported brands/microbrews must have exceeded 1.5 million cases with double-digit growth over the past four years. The list sums up what’s selling in the beer world now: IPAs, Mexican brews and FMBs. In fact, the only Fast Track brand that doesn’t fit into one of those categories is Stella Artois. The Belgian pilsner, the fastest-growing European imported beer, according to IRI, was up 14% over 2015 to reach 32 million cases sold. IPAs remain by far the best-selling type of craft beer. The continued success of Lagunitas, Goose Island and Ballast Point Sculpin IPA illustrates the enduring strength of the style. It doesn’t hurt, however, that all three IPA brands also now have the power of massive parent companies. Goose Island was sold to A-B InBev in 2011; Ballast Point was acquired by Constellation Brands in November 2015 in a $1 billion deal; and Heineken USA purchased full control of the Petaluma, CA-based Lagunitas this past May. Another Heineken USA brand, Tecate Lite, is on the Fast Track, growing 21% in 2016 to reach nearly 6 million cases. And another Constellation brand, Modelo Especial, is the Fast Track leader, with 83 million cases sold—an 18% increase over 2015. The non-beer Fast Track brands this year are Twisted Tea and Mike’s Harder. A hard iced tea brand launched in 2001, Twisted Tea was a bright spot for parent company Boston Beer during a challenging 2016. It increased in 10% to nearly 11 million cases in 2016. Mike’s Harder, a higher-alcohol version of the original Mike’s Hard Lemonade, has been a success since its 2009 launch. The brand is up 15% to nearly 9 million cases in 2016. Established Growth brands are top-selling beers that have grown moderately or substantially in the past four years and that exceeded 2 million 2.25-gallon cases in 2015. As always, many of the biggest beer brands have not been able to show growth in recent years and therefore aren’t on the list. Constellation’s Corona brands remain strong. Corona Extra is the largest of all of the 2017 Growth Brands at 123 million cases sold in 2016—a 5% increase over 2015. Corona Light, the low-calorie version of the Mexican pale lager, was up 6% to 16.4 million cases. Another Constellation brand from Mexico, Pacifico, posted impressive growth of nearly 17%. The crisp, Pilsner-style lager, sold 7.8 million cases in 2016. Pacifico, which earlier this year launched its first-ever 12-oz. can in the U.S. market, in July sponsored the X Games Minneapolis 2017. Mexican lager Dos Equis grew 4.0% to reach nearly 30 million cases in 2016. The brand has had substantial exposure from its “Most Interesting Man in the World” advertisements created in 2006. Michelob Ultra was the top gainer among the Established Growth Brands, continuing impressive, double-digit growth and reaching nearly 71 million cases in 2016. The low-carb, lowcalorie light beer also enters our Hall of Fame, as this marks its 10th Growth Brand. Once again, the lone Comeback Brand this year is Pabst Blue Ribbon. Comeback Brands have rebounded in sales to at least the previous level after a recent decline. After falling slightly, from about 37.4 million cases in 2013 to 37.2 million in 2014, sales of Pabst Blue Ribbon increased 2% to nearly 38 million cases in 2015. While PBR was nearly flat in 2016, its scant case-sales increase helped it secure its Comeback Brand status. The company announced this past June that its was partnering with the Chicago White Sox and offering Pabst craft and legacy brews, as well as PBR and Old Style, at the team’s Guaranteed Rate Field ballpark.